A line in the sands of Australian democracy has now been drawn following Clive Hamilton’s ambitious and breathtaking study of Chinese influence over our government, media and society. As the publishers get cold feet when Bejing rumbles, the debate heats up and now the publication becomes more compelling and of critical importance to every ‘Australian’. Here are just a few of the excerpts to reach the media and for now its a case of watch this space..carefully. STAN GRANT, PRESENTER: It has been a while since Australia has seen a piece of writing pulled from publication amid claims of censorship. So when a book about covert Chinese Government influence in Australia was dropped by Allen & Unwin, it drew immediate attention. Clive Hamilton is a professor of ethics who has spent a career writing about public issues from climate change to economic equality and contemporary morality. But it was when he turned his pen to the role of the Chinese Communist Party in Australia that he encountered a topic that bit back. DYLAN WELCH, REPORTER: As China’s power grows, so too do questions about the authoritarian state’s influence in Australia. Over the past two years, Clive Hamilton has chronicled the covert power the Asian giant is wielding here. CLIVE HAMILTON, PROF. OF PUBLIC ETHICS, CHARLES STURT UNIVERSITY: I found in the research process that the influence of the People’s Republic of China, the Chinese Communist Party, is really very extensive: much more than we realised, into all sorts of Australian institutions, in ways that you wouldn’t really imagine. DYLAN WELCH: The book, ‘Silent Invasion’, was to be released next March. A fortnight ago Clive Hamilton took a call from Allen & Unwin, saying they wanted to delay the book by more than a year. CLIVE HAMILTON: Well, Allen & Unwin have said to me that they would want to wait to see how two large defamation cases turn out; and then they would reconsider. But from an author’s point of view, what they were effectively saying is: you know, “Put your manuscript on a shelf to gather dust for a year or 18 months; and then we’ll come back and reconsider.” I mean, that’s just not tenable for an author. DYLAN WELCH (Jun. 2015): Hi. I’m Dylan Welch from the ABC. DYLAN WELCH: Last month, the Herald Sun published an apology after it wrote an article critical of billionaire Huang Xiangmo. In 2015, 7.30 tried to ask him questions about millions of dollars in political donations made by him and those close to him. DYLAN WELCH (Jun. 2015): Yeah, so I just wanted to ask Mr Wong why it is he makes so many political donations in Australia? INTERPRETER (Jun. 2015): He has some next appointment. So we are going to make an appointment with you. DYLAN WELCH (Jun. 2015): OK. I will give you my card. INTERPRETER (Jun. 2015): Yeah, OK. Thank you very much. DYLAN WELCH: Huang Xiangmo has previously denied his donations are designed to influence politicians here. NICK MCKENZIE, REPORTER (Jun. 2017): Dr Chau’s money allowed him to regularly rub shoulders with the great and good of Australian politics. DYLAN WELCH: Another billionaire, Chau Chak Wing, is suing the ABC and Fairfax over a series of stories about Chinese influence in Australia. Dr Chau says the stories were not true. Clive Hamilton doesn’t believe anyone at Allen & Unwin was directly coerced. CLIVE HAMILTON: It was enough to have this perception, this shadow of punishment hanging over the publisher for them to act in the way they did: and that, in a way, is a lot more scary. What the publisher has said they are worried about is an organised campaign by a foreign government, using Australia’s defamation laws, to target the publisher and punish it. DYLAN WELCH: And China’s role in printing millions of books every year may have also factored into the publisher’s decision. CLIVE HAMILTON: Many Australian publishers have their books printed in China. It’s the cheapest place to get quality printing done. It would be very easy to cut off that route and thereby drive up the costs of any publisher that displeased Beijing. SANDY GRANT, HARDIE GRANT PUBLISHING: It is definitely an attack on freedom of speech. The very fact that publishers have to sit in their office, thinking: “This is a risk I have to calibrate and act on,” just shows the environment and shows the problems. DYLAN WELCH: Sandy Grant knows about book censorship. SANDY GRANT (archive): It is very exciting just to read what a spy did day-to-day through the Cold War. DYLAN WELCH: In the late 1980s he fought the British government’s attempt to ban in Australia a spy memoir called ‘Spycatcher’. SANDY GRANT: Having gone through ‘Spycatcher’: yeah, governments do try to interfere with people publishing. They do want to make an impact and prevent things from getting into the public domain. And I’m sure the Chinese Government are of that mood at the moment. DYLAN WELCH: This morning, Australia’s Acting Prime Minister was dragged into the Allen & Unwin stoush. JULIE BISHOP, ACTING PRIME MINISTER: In Australia we uphold the right to freedom of speech. We are a free and open society. Our foreign policy is not dictated to by other countries. I would have to find out the precise details of his contractual arrangement, but I would be concerned if there were any attempts to stifle free speech in Australia, particularly at the behest of a foreign government. DYLAN WELCH: Clive Hamilton has since had three offers from other publishers and the book may still hit shelves early next year. CLIVE HAMILTON: I hope it is a wake-up call. I know that Chinese influence in the political parties in Australia is very, very extensive: we’ve seen that through media reports. But it’s also true that there are some political leaders who are increasingly anxious about the influence of the Chinese Communist Party in Australia. And we must hope that those who do get it prevail. Prominent Charles Sturt University author and ethicist Professor Clive Hamilton says his book exposing the Chinese Communist party’s activities in Australia will still be published, despite Allen & Unwin cancelling plans to print it at the 11th hour. On Monday, Hamilton revealed legal advice that the Chinese government may sue for defamation had spooked Allen & Unwin. 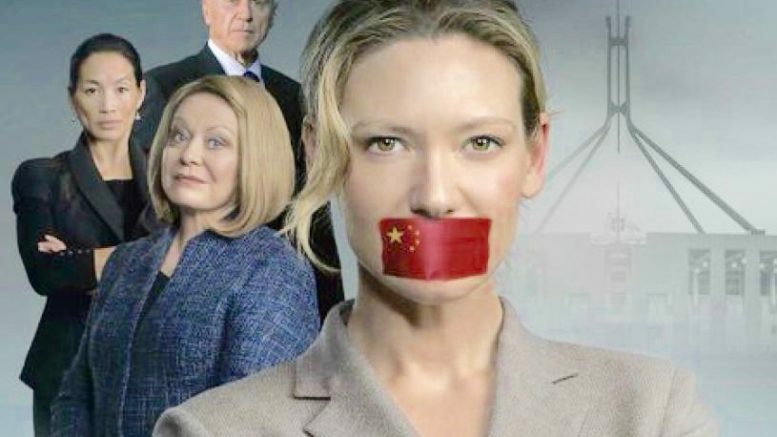 The book, called Silent Invasion, is a comprehensive analysis of the Chinese government’s methods of asserting influence in Australia – not only in media and politics, as had been previously reported, but in a range of others areas.